If you are curious to know what kind of food you can expect to eat in Cuba you are in the right place. I have a good news for you: if you like rice you’ll probably like the 50% of the cuisine. In fact, rice is the basis of any dish you’ll see served on the table. You can order this food separated or mixed in many variants, often all together. For example chicken, rice, beans, malanga and bananas. Sometimes with vegetables as cucumbers and tomatoes. Everything is good but it also depends where you are going. 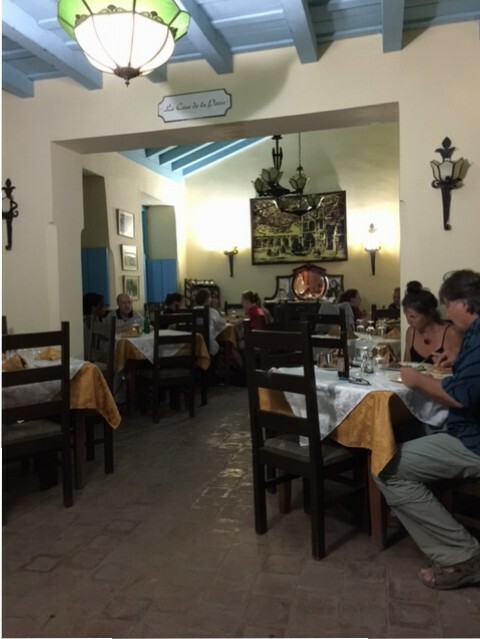 The quality of the restaurant in Havana is generally good but you need to know the best places. One of the most famous restaurant in the Old Havana is Los Nardos, just in front of the Capitolio. Usually there’s a long line outside the entrance. You have then to climb the stairs till the first floor. The restaurant is not expansive but you can also find cheaper places with good quality food and great service. You just need to walk and get lost in the streets of the city to find good and charming places. In my personal experience after about 4-5 days I start feeling the need for something different. I’m Italian and I need some pasta or Mediterranean cuisine after a while! You can find pizza and pasta, both in local or Italian restaurant. Of course you won’t find all the Mediterranean ingredients in any place. Here you can find an interesting list of restaurants in Old Havana. This was a brief list on what to eat in Cuba. Another post with the best places to eat will be posted in future, so be sure to subscribe to newsletter to get the latest news straight into your inbox!